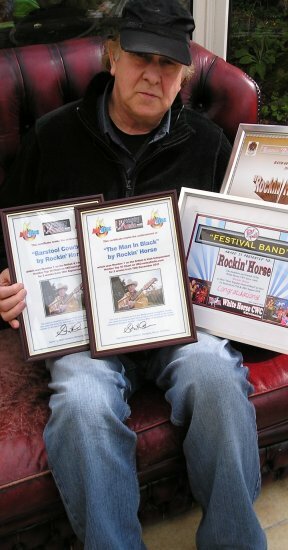 George Inglis has been a regular on the country music scene for many years but it's only now he's achieving the success after plenty of hard work and dedication. Getting a guitar at the age of 10 sparked his interest in music, and before long he was playing in bands as a teenager in the exciting period of the early 60s. In 1964, a trip to Dublin got him hooked on traditional music, and with friends started a folk club on his return to Scotland. This led to him staging various events and progressing his music career. The band Rankinfile, which he produced, landed a record contract and this led to considerable airplay towards the end of the decade. By 1970 George was in a duo called Red Pepper and they had a regular slot on BBC Radio Scotland. After a break from music he returned in 1977 as a country act with a band called Rockin' Horse, making a single, "Old Fashioned Rock & Roller." This led to the self-penned album "Land of Magic" which featured songs all about the Scottish Borders. Rockin' Horse have been going since then with plenty of work coming in and the highly successful self-penned album "Barstool Cowboy" which spawned three number 1 singles in the British & Irish Hotdisc Top 10 chart. Television appearances over in Ireland and on BBC ALBA have increased his exposure and after decades working in bands, George has finally come into the spotlight in his own right under his own name. Rockin' Horse is still the name of his band, but for the next part of his career the focus will be on himself as a singer and songwriter. Latterly George has filmed five videos including one for his latest single, "Dear John (Lennon)" and "I Am The Train" which is featured in the movie "The Story of the Borders Railway." It has gained exposure on ITV and BBC, while his previous single "Missing You" from the album, "Anthology" topped the British & Irish Hotdisc Chart.